Ambassador Lars Faaborg-Andersen insists the EU is against BDS despite its decision to label Judea and Samaria products. 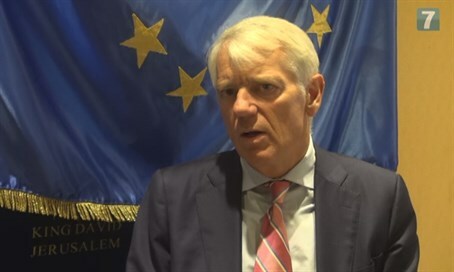 The EU Ambassador to Israel, Lars Faaborg-Andersen, on Monday stressed that the European Union is opposed to the anti-Israel Boycott, Divestment and Sanctions (BDS) movement and that the body’s decision to label products from Judea and Samaria did not constitute a boycott. Faaborg-Andersen participated in the Yedioth Ahronoth newspaper's anti-BDS conference and his remarks were quoted by the newspaper. "Sometimes extremist settlers criticize me, and now, the BDS movement does," he said, in reference to calls from BDS activists to boycott the conference. While Faaborg-Andersen reiterated the EU's stance that Israeli “settlements” are “illegal under international law” and “a hindrance to the peace process”, he stressed the EU was not boycotting Israel. "Our policy is engagement with Israel. We are Israel's largest trade partner, and we are Israel's most important international partner in science, technology, and the list goes on," he said, according to Yedioth Ahronoth. "This isn't a boycott,” he added, in reference to the decision to label Judea and Samaria products. “We let (settlement products) be sold in Europe, but they have to be correctly labeled," he continued, justifying this stance by claiming that "the West Bank" is not part of Israel. On November 11, the EU passed a decision to label products from Judea, Samaria and the Golan Heights as “settlement products”, resulting in tensions with Israel. Following that decision, Prime Minister Binyamin Netanyahu, who is also foreign minister, ordered the freeze in discussions with EU on the peace process. But last month, Netanyahu and the EU foreign policy chief Federica Mogherini agreed to end the freeze on talks on the Israeli-Palestinian conflict, with Mogherini telling Netanyahu that the labeling decision "does not prejudge the outcome" of the conflict. In his remarks Monday, Faaborg-Andersen argued that the threat of BDS should not be blown "out of proportion," and stressed that at present, the movement actually holds very little influence. With that in mind, he insisted that the BDS movement should not be given too much attention, as it could boost the movement's power. He also said that the key to defeating the BDS movement is in Israel and the Palestinians resolving their conflict. Israel, he said, should stop "being seen as undermining the two-state solution" and must "show more of a will to move forward with the process." "With no Palestinian issue, there will be no BDS issue. We don't expect Israel to be able to solve this issue alone," said the EU ambassador, according to Yedioth Ahronoth.